What is the state of Kenyan Citizen Media? Moderating the discussion is Robert Kunga. Robert asks: What is citizen media? Collins talks about the Kenyan experience of citizen media. Bloggers and microbloggers in Africa are very prolific. Kenya has the second greatest number of twitter acounts in Africa. Kenya is the third largest blogging Africa country next to South Africa and Nigeria. Close to 20 million people are using mobile phones in Kenya, and the majority of those are accessing the Internet from their phones. According to recent research, most people are using the Internet to find the latest news as well as talk to their friends. Judith's organises Akirachix, an organisation which connects women to technology. They do this by blogging all of their activities, putting media online to show what's happening. Coordinating over blogs, Twitter, and LinkedIn. They now reach beyond Kenya to Uganda and Zambia. What's the state of blogging in Kenya? Kennedy Kachwanya talks about blogger coverage of the post-election violence in 2008. He also tells us about Ushahidi, a crowd-mapping platform. To encourage more blogging, the Blogger's Association of Kenya offers an annual award, the “Bloggers.” At the moment, Keny has at least 11,000 bloggers. What are the challenges for citizen media? Blogging mostly happens in urban centres, where there is the greatest Internet penetration. Kennedy hopes that some of the 3 million Kenyan mobile phone users will be able to share their stories. Collins points out that local regions often lack media in local languages. That trend is starting to change; we're now starting to see indigenous languages show up online. Hate speech is another challenge for citizen media online. Just yesterday, the Kenyan government started talking about monitoring speech online, especially in light of the upcoming election. How is citizen media used in Kenya? Judith points out that citizens are using microblogging to critique the government. In a recent case, the Kenyan parliament tried to change the constitution to institute a university degree requirement for holding office. Judith points to broad public complaints over twitter, which she thinks swayed the president to reject the constitutional amendment. Kennedy highlights ways that blogs challenge international perceptions of the country. He points to the #PrimitiveEnergy hashtag, where Kenyans challenged a Korean airline's derogatory ad. Recently, when CNN published an article about violence in Kenya. He also encourages to follow the #KOT hashtag, which stands for “Kenyans on Twitter.” Social media has also been used in Kenya for crowdfunding health initiatives and creating awareness. One of the most followed Kenyan twitter accounts is @KenyaRedCross, which shares information and coordinates support. What is the relationship between the government and citizen media? Kennedy thinks that the government is positive towards citizen media; some of the IT board members are former bloggers. But like most governments, Kenya is watching closely; they don't want to face uprisings. But Kennedy thinks that overall, the government sees itself as a partner rather than an adversary. All the same, he hopes things stay the same. Collins tells the story of #140friday, an online discussion about why more government contracts weren't going to Kenyan companies. The government noticed and responded by meetng thos bloggers and pledging to offer more contracts to local companies. How are people using video in citizen media? Collins points out that in Nairobi and Mombasa, the Internet connection is very good. In those places, it's possible to watch video without a problem. For now, most content is text. Kennedy cites examples of agriculture-focused photoblogs which document farming practices. Musicians and political activists are using YouTube. Political candidates now all websites in hopes of reaching Internet users from ages 18-30. Judith thinks we shouldn't focus on format; what matters is the relevance of content. Kenyan twitter users most live in Nairobi and share common interests. She wonders about people in rural areas whose needs and interests aren't met by content from most bloggers, no matter the format they use. What offline citizen media are people using? Kennedy mentions ways that progressive movements are also doing things offline. He points out the Feruary 28 Movement on Twitter, which led people to meet offline to sing the national anthem throughout Kenya. He also highlights the online and offline poetry of Njeri Wangari and POWO, Kenyan Poets and Writers Online. Collins tells us about regular happy hours for Nairobi bloggers. How are Kenyans using citizen media for education and entertainment? Collins talks about the music videos of Juliani, who highlights the work of the slums. He thinks that all Kenyan Citizen Media is series; trending hashtags are now featured in mainstream news. Kennedy points us again to #KOT and the jokes, play and entertainment which Kenyans discuss. When the ICC announced upcoming trials of Kenyans accused of involvement in post-election violence, Kenyans made playlists of music videos. Judith tells us about the Makmende video, the first viral video in Kenya. Many people around the world know about the role of blogging in post-election violence in 2008. Ethan Zuckerman wonders what Kenyan bloggers want the world to know about the upcoming election, and what kind of suport they want from the international community during and after. Collins responds that what everyone wants most of all is a peaceful election. He hopes that the next election can be as peaceful as 2002. He thinks that international bloggers should highlight positive things from Kenya– not just the slums. Kennedy responds that we should expect citizen media to offer an alternative channel to traditional and international media. They will be everywhere: at the polls and on the street with twitter, blogs, and photos. He urges people elsewhere to follow citizen media for credible information instead of just relying on national and international press. A participant who represents an IT center and library offers a concern: after the post-election violence in 2007 and 2008, slums were the most affected areas. We can talk about blogs, but people there still rely on what they see and what they read in paper. Judith mentions that in the slums, there are often people who function as information resources for their communities; perhaps they can work with bloggers. Kennedy mentions that the Blogger's Association of Kenya would be happy to aggregate content by bloggers from the slums. Enrique from InterNews asks if they think online speech in Kenya should be subject to legal regimes that currently apply to print and broadcast, if it should get its own law, or if it should be unregulated. Kennedy, who is a lawyer, mentions that while there are no Internet-specific laws, the Kenya Communications Act does have provisions which can monitor and penalise activities online. He hopes that Kenya will have specific laws governing citizen media. Those laws should provide a framework for effective practice but not hamper citizen media. 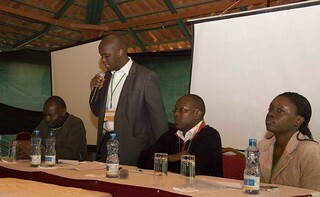 A blogger from Nairobi asks about citizen media by deaf people in Kenyan blogosphere. Kenya points to initiatives in Kibera to support blogging by deaf people. Judith mentions a new grant from the Kenyan government to support NGOs that are helping deaf people express themselves online. A participant from Institute for Human Rights and Development in Africa asks what initiatives exist to ensure Internet freedom of expression. Kennedy responds that while individuals are working on Internet freedom, there is no organised project. As the government decides how to respond to Al-Shabab's internet media, he think that need is even more pressing. Robert shares a question from Twitter: “when talking about relevance on the ‘net, what does relevance mean?” Kennedy thinks that local relevance will come as more people come online and start producing content. For now, most content is focused on situations from urban centers, but he hopes to see more rural content soon. Collins thinks that 95% of the content about of Africa is not actually from Africa. Media from Kenya should be defined by the people who are seeing and experiencing the issues they report. A senior lecturer in journalism at Coventry University suggests that Kenyan bloggers just reinforce what the mainstream media covers. He suggests that bloggers need better organisation to counter the concentration of power in the mainstream media. The Nation Media Group and The Standard are powerful, and candidates running for president have owned conventional media. He points to questions about deaths that Kenyans know about, but we need bloggers to find and highlight evidence. Kennedy does think that most bloggers aren't proactive for change. Nevertheless, he points us to Mumati's MarsGroup Online (blog), a blog which covers corruption and accountability. Robert points out that many Kenyans trust traditional media. For now, Kenyans are getting breaking news much faster online. He hopes that will lead to greater public trust for citizen media online. Kennedy calls bloggers the Kenyan Fifth Estate and cites their ability to influence international corporations. He thinks we can look forward to a Kenyan citizen media to become more mature and more active for change. Collins reminds us that GlobalVoices has asked Kenyan bloggers to write a blog post about how to use citizen media in the upcoming election year and expects it to come out soon.